We hope that you will join us to celebrate the poignant and beautiful work by this year’s Art Lab pupils at a special event held at Raven Row Gallery. Over the autumn term, Iniva artist Shiraz Bayjoo led a programme of research and art making for Year 4 pupils at Dawlish and Newport schools, part of the Opossum Federation. 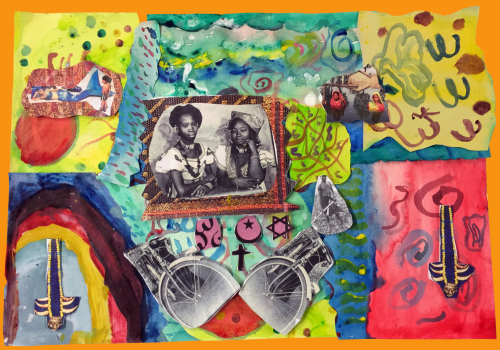 Using his own films, watercolours and installations alongside cards from ‘Let’s talk about values‘ featuring his art work, Shiraz helped pupils explore how personal, family, community and national values are relevant to us all. A Space creative therapists Georgina Evans, Martina Nalesso and Jo Evans joined selected workshops to support pupils in reflecting on how living our values can positively impact our emotional life and our relationships with others. 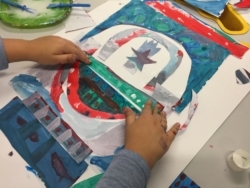 Nine students were also selected as Art Leaders to work more intensely with Shiraz and the A Space team. Andy Rumball, a photographer now based in Berlin, was also invited by Opossum to run workshops using ideas and themes from ‘Let’s talk about values’ as a starting point. The work Year 5 pupils produced in collaboration with Andy illustrates the ways in which the Emotional Learning Cards can inspire thought-provoking art making while prompting discussion on themes that are increasingly important to us all. We warmly invite you to join us on 24th January to see how our emotional learning cards can be used in the classroom, in therapy sessions or in workshops to set the scene for creative exploration and art making.